This face frame hinge opens to 100 degrees with a 5/8 in. overlay. Product is all metal construction with a nickel finish. Locating tabs for easy mounting on frames. 2 hinges included (1 pair). 35mm 100 Degree Face Frame 5/8 Overlay Hinge, 2 per package This face frame hinge opens to 100 degrees with a 5/8 in. overlay. Product is all metal construction with a nickel finish. Locating tabs for easy mounting on frames. 2 hinges included (1 pair). 35mm 100 Degree Face Frame 5/8 Overlay Hinge, 2 per package is rated 4.4 out of 5 by 20. Rated 4 out of 5 by Calum from Good value Purchased multiple pairs as part of a refurbishment of an older kitchen with solid oak frame & panel doors. 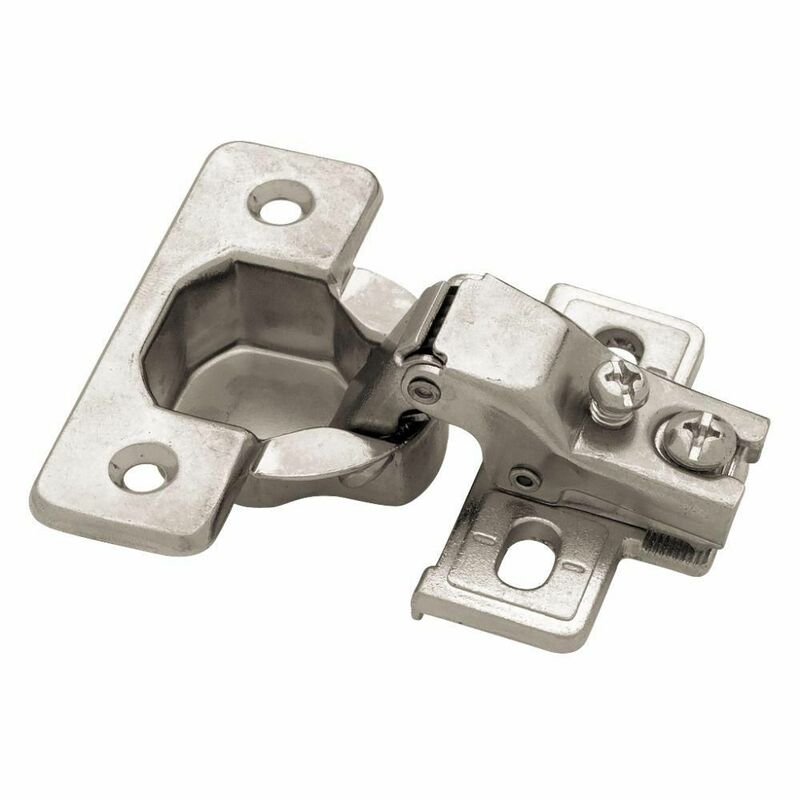 These are good value for the cost in a concealed Euro-style hinge and an easy retrofit. They have adjustments in three directions to help align doors once mounted. Note they are self closing, but not soft closing so they do snap the doors closed with a bit of a bang. We were converting the doors from exposed type hinges to these concealed types and installation was easy and straightforward once the holes were drilled. NOTE: the drilling template included with the instructions is incorrect and puts the screw mounting holes too close to the edge of the door to function well. If making new doors or converting to the 35mm type, mark and drill the 35mm hole, then insert a hinge and use that to mark the mounting screw locations. They mount to the face frame with two screws in elongated holes and this gives the vertical adjustment. Rated 3 out of 5 by macsbacks from good hinge, quick ship, but charged brokerage fee Good product. But as charged $22 on a $8 purchase for brokerage and border taxes as shipped from US even though ordered from homedepot.ca Home depot noted their error and have supposedly taken care of the account, but not nice to get a bill from UPS. Rated 5 out of 5 by Steven from Great hinge!!! This is a significant design upgrade from the original model that used plastic fo... Great hinge!!! This is a significant design upgrade from the original model that used plastic for the spring action which ultimately broke with age and caused them to snap very loudly when actuated. Very annoying. These new ones will likely out-live me. Rated 5 out of 5 by Marigoland from Easy to install. Fit into existing holes. Good quality. Easy to install. Fit into existing holes. Good quality. Rated 4 out of 5 by Roland from Not what I thought Unfortunately, this is not the correct size. My mistake as I do not know how to tell whether the part that goes into the hole is the correct size when looking at the dimensions. Ordering, delivery and pick up were good. Rated 4 out of 5 by Greg from Exactly as I ordered It exactly replaces the broken hinge that would be replaced. Rated 5 out of 5 by superdave from Best kitchen door hinges for my needs. It was exactly what I needed. It didn't have any plastic insert that would break like the hinges that it was replacing.